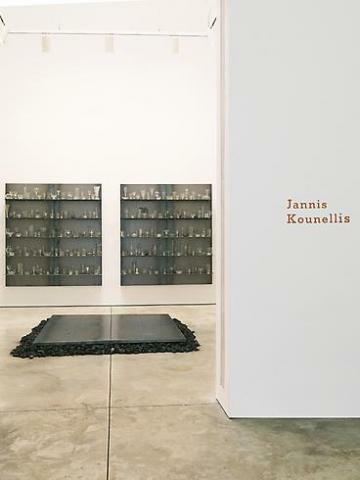 Cheim & Read is pleased to announce an exhibition of new work by Greek-born, Italian artist Jannis Kounellis. This exhibition incorporates the themes and concerns of Kounellis's best known work, while also reacting to and engaging with the gallery as a unique space. Kounellis's last gallery show with Cheim & Read was in 2006; he recently created an installation for the gallery's booth at the ADAA Art Show in early March, 2013. Kounellis was born in Piraeus, Greece in 1936. World War II and ten years of civil war shadowed his childhood. In 1956, he moved to Rome and by 1960 was an active member of the Arte Povera movement. Kounellis has long combined art and history with the immediacy and tangibility of the present. Since February, he has been in residency in Brooklyn conceptualizing and making work for this exhibition; all of the materials for the show have been locally sourced. Kounellis's multi-layered, eloquent installations juxtapose earthy substances (i.e. coal, wool, iron, glass, stone) with evocative objects (such as sewing machines), producing theatrical compositions in which "art" collides with the "everyday." In this way, he attempts to deconstruct and re-contextualize artistic and cultural hierarchies, challenging not only the consumerist ideology of the art market but also the viewer's passive gaze. His ongoing investigation of material, process and adaptability references social and political concerns (commerce, agriculture, trade, labor), while his use of personal artifacts (overcoats, hats, shoes) sympathizes with the human condition, alluding to ideas of transience and regeneration. Though the performance-based and sculptural aspects of his work are apparent, Kounellis ultimately identifies as a painter; his canvas is real space. This sense of dimensionality was most famously demonstrated by his 1969 exhibition of twelve live horses at Galleria L'Attico, in Rome; the installation addressed the long history of equestrian representation while profoundly transforming the viewer’s experience. Kounellis’s classically-composed scenes are informed by his thorough understanding of art history, narrative and myth. Inherent tension between opposing elements deepens the poetic resonance of his chosen materials. As he has described: inorganic elements provide structure, organic elements provide sensibility. This dichotomy culminates in installations which are simultaneously pensive and engaged, meditative and provocative, spontaneous and deliberate. In the current exhibition, Kounellis contrasts industrialism with domesticity in large-scale tableaus: vintage stemware is shelved against cold-rolled steel, provoking palpable unease between the glassware’s fragility and the steel’s hard surface. Similarly contrasting textures echo throughout the show: soft black coal is positioned under, against or on top of steel slabs; shapeless overcoats are loosely hung on the sharp corners of I-beams; sewing machines and stone are wedged in the recesses of metal walls. Kounellis’s positioning of these objects, and the reverberation of their interaction, makes the viewer physically conscious of his progression through the gallery space. As is his intention, Kounellis succeeds in subtly positioning his audience so that they become active participants in his scene. Kounellis lives and works in Rome. His first New York solo show was in 1972. Recently, he has had exhibitions at the Museum of Cycladic Art, Athens, Greece (2012); the Museum of Contemporary Art, Herning, Denmark (2009); the Neue Nationalgalerie, Berlin, Germany (2007); the MADRE Museo d'Arte Contemporanea Donnaregina, Naples, Italy (2006); and the Galeria Nazionale díArte Moderna, Rome, Italy (2002), among others. Kounellisís work is represented in many national and international collections.